The number of features and the general complexity of modern cars means owner’s manuals are now thick enough to double as doorstops. 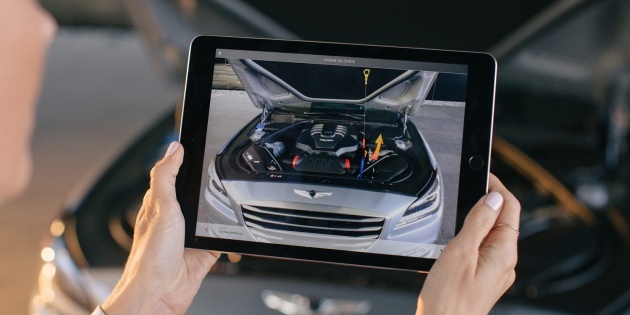 Hyundai’s Genesis luxury brand hopes to address this problem using augmented reality. It created the Genesis Virtual Guide for its G80 and G90 sedans as a high-tech update of the traditional owner’s manual. It includes 135 how-to videos and 25 3D-overlay images that appear when the user scans different areas of the car, like the engine bay or dashboard. All a Genesis owner needs to do is hold their smartphone or tablet over a given area of the car and different visual aids appear. Scanning the engine compartment, for example, pulls up maintenance instructions. These cover engine oil and brake fluid levels, jump starting, air filter replacement, topping off washer fluid, and provide an explanation of the fuse box. Owners can also use the AR manual to learn how to change a tire.